In real estate it’s all about ‘location, location, location!’ but when we come to implementing coaching in schools, context is everything. This article will explore the factors that education leaders should consider in attempting to establish coaching and coaching approaches in their school context. Before considering these factors, we should establish what we are talking about when we use the term coaching. Coaching in education is defined by Professor Christian van Nieuwerburgh (van Nieuwerburgh, 2012, p.17) as: … a one-to-one conversation that focuses on the enhancement of learning and development through increasing self-awareness and a sense of personal responsibility, where the coach facilitates the self-directed learning of the coachee through questioning, active listening, and appropriate challenge in a supportive and encouraging climate. There are many definitions of coaching but this particular one is helpful in that it highlights the intent of coaching – self-directed learning and development – and two key outcomes of coaching – self-awareness and responsibility. This definition also emphasises the role of the coach as facilitator as well as pointing to the importance of the skills of the coach – particularly in questioning and active listening. Finally, the notion of supportive challenge is raised and the importance of the relationship alluded to. The terms coaching and mentoring are often conjoined and their meanings conflated in educational discourse. This can cause some confusion. The key difference between coaching and mentoring is one of intent – what is expected, invited or solicited when entering into either of these engagements. Mentoring is often described as an expert–novice relationship where there is an expectation of advice-giving based on the greater experience, knowledge or skill level of the mentor. It can also be a longer term and less formal engagement than coaching. Mentoring can be the default form of 1–1 support in schools. Indeed, there can be an assumption that the most efficient and ‘leader-like’ thing to do when someone is stuck or facing a challenge, or even just looking to enhance their practice, is to tell them what they should do. There are certainly times when this is appropriate and necessary. The case of Graduate teachers who “don’t know what they don’t know” or who have themselves identified gaps in their pedagogical repertoire, is often cited here. However, there are risks in adopting a default mentoring or advice-giving stance as teacher leaders. Edgar Schein (2009) describes the notion of ‘helper as expert’ as a cultural stereotype to which we attach particularly high value in the Western world (Schein, 2009). He goes on to explore the issues with this form of helping from both the perspective of the helper and the ‘client’. Schein points out the unconscious but “strong seductive emotional force” at work when we adopt the position of helper. Jumping to giving ‘helpful’ advice too soon more often than not creates an unhelpful “status differential” in the relationship. If we are looking for a more professionally empowering and contextually respectful approach then coaching fits the bill as a positive default stance. Being contextually respectful is about seeing each teacher as the expert in their own context – their classroom with their students. By encouraging and allowing teachers to do the thinking, coaching builds a strong sense of self-efficacy and enables agency. Here, agency is not something that people possess but something that they achieve (Priestley, 2015). Agency emerges dependent on the quality of the engagement of individuals with “temporal-relational contexts-for-action” (Biesta, Priestley & Robinson, 2015) rather than as a quality of the individuals themselves. Effective coaching can facilitate the achievement of agency for teachers by facilitating thoughtful and deliberate engagement with their own “contexts-for-action”. This is a conversation that I’m increasingly having with school leaders and teachers as they consider where coaching can have a positive impact in their context. A very useful framework for exploring potential starting points is the Global Framework for Coaching in Education (van Nieuwerburgh & Campbell, 2015). Based on their extensive experience of coaching in education, the authors propose four portals, or entry points, for coaching in education (Figure 1). Within each of these portals there are many conversational contexts where coaching and coaching approaches can make a positive difference. For example, starting in the professional practice portal, the conversational contexts might be around teacher professional learning, individual goal setting and development planning, or classroom observation and feedback. The next question to consider is how coaching or a coaching approach might enhance the quality of conversations in these contexts. In these examples, it could be about transfer of learning from ‘traditional PD’ into classroom practice, de-privatising practice and building collaboration, or simply creating a safe space for teachers to talk about their practice and identify next steps in their development. Entering coaching through the educational leadership portal might involve upskilling leaders (at all levels) so that they can adopt a ‘coaching stance’ in their developmental and performance related interactions with their teams. This could be about conversations being less adversarial and more growth and development orientated. Equally, coaching could be provided to support the development of the school leaders themselves. It can be argued that student success and wellbeing is the ultimate goal in all of our work on improving the quality of conversations, and the resulting actions, in school communities. 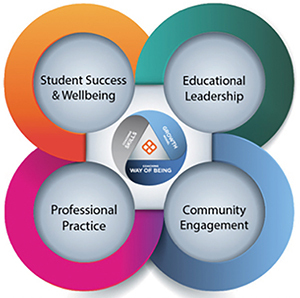 In this way, the student success and wellbeing portal might be seen as an outcome rather than an entry point. As an entry point, the contexts here could be pastoral conversations between teachers and students or conversations to support student academic and personal goal setting and action planning. It could also mean training students as coaches and deploying them as a service to their peers. The community engagement portal is probably the least well developed starting point for coaching in schools. However, if our aim is to improve the quality of conversations right across the school community then we will find several very impactful contexts here. Communication between parents and school, and parents and their children, are the most obvious examples. Indeed, the desired outcomes are not that different to those for teachers and other members of the school community: authentic engagement, genuine collaboration and partnership, and agency. So, thinking about the conversational contexts in your school setting, where do you see coaching and coaching approaches being helpful first? And, if coaching is the answer in that context, what is the question? E.g. How can we improve/help/enhance/strengthen…? Or, how can we change the nature of conversations about ‘x’, so that ‘y’ improves? Imagine six months from now, coaching is making the positive difference that you’re hoping for… what will you be noticing? What will teachers be noticing? What will school leaders be noticing? What would that look/sound/feel like, precisely? In answering these questions, you are beginning to gain some clarity around what’s wanted – in Solutions Focus language – your ‘future perfect’ (Jackson & McKergow, 2007). Let’s start with the human factors. Teaching is a highly personal endeavour and is often bound up in a deeply held view of what it means to be a professional educator. With this in mind, any mechanism that invites teachers and leaders to think deeply and talk about their practice is potentially threatening. Add to this the prevailing backdrop of performativity in education and the judgement or measurement of teachers in some systems, or at the very least, people’s previous experiences and perceptions of less positive interventions, and we might not have the most receptive audience! Some of this anxiety can be alleviated through clarity of intent and genuine follow-through to demonstrate that the process, and those coaching, are trustworthy. This is when professionals become more willing to make themselves vulnerable (in the safe space of a coaching conversation) in the pursuit of growth and enhancement. At an organisational level, leaders need to be up-front in endorsing and advocating coaching as a better way of having professionalising conversations in their school as well as modelling a coaching stance as leaders. If coaching is perceived as a way of ‘fixing’ or a ‘treatment’ for teachers then they’ll understandably resist. This might be based on prior experience of a less professionally respectful culture or history in the school. This needs to be addressed and, again, openness and clarity of intent is key. On a practical level, schools need to consider how they create space and opportunity for coaching as a new form of professional learning. If it is treated as an add-on then it may not get much traction. The ways of addressing this can be highly context specific. They range from reconfiguring meeting times, and better utilising this time, to recognising coaching and classroom observation as valid professional learning activity. In turn, coaching activity can and should be allocated resources in the same way that traditional PD is supported. This can be a light-bulb-moment for some leaders – how much does it cost for a relief teacher for a day versus sending someone out of school for the day plus relief costs? How many valuable and productive conversations could be supported in a day instead? It’s never quite that simple but it is a start towards changing perceptions of what ‘counts’ as professional learning activity and the issue of ‘return on investment’. In the past, what has helped support changes that involved new ways of working in your context? What’s already in place that might support the introduction of coaching in your context? E.g. resources, experience, structures, other forms of professional learning, conversations about teaching and learning, norms and culture/climate, etc. What makes these things work well? What else? What else? How will coaching complement current approaches to teacher learning? Professional Learning Communities? Peer-observation? What could you stop doing or do differently? What are the points of reference for conversations about teaching and learning in your school? Do you have a set of agreed principles or a model? Do you make use of the AITSL Standards in developmental conversations? What are your school-wide priority focus areas? To what extent do these influence individual teacher goals? Thinking about a coaching style of leadership, or stance, what would this look like for you? What would your staff notice? What would be the benefits to you and your staff? Who needs to be onboard with this and what training might be required? Ideally, we want to gather a coalition of the willing – the champions, early adopters, and even one or two cynics to provide challenge as we develop the process in context. Through getting started and experiencing coaching, alongside some form of training, we’re beginning to build an internal coaching resource and establishing common language and understandings. This takes time but positive coaching experiences grow more coaching opportunities and more ‘portals’ begin to open. As we have seen, context is the recurring theme here. Introducing coaching in schools cannot be viewed as a structural or logistical exercise alone. Coaching is not an add-on intervention. The highly relational and dialogic nature of coaching and coaching approaches means that the human factors need to be considered first. Then, as we attempt to scale-up coaching opportunities across the school community we have to consider the organisational factors to enable this. Training is essential – specific skills and attitudes are required to coach well and a strong internal coaching resource is necessary to sustain the development of a coaching culture over time. In closing, we should view this as a journey towards a coaching culture. There will be different routes, detours and speedbumps along the way. We’ll know we’re on the right track if we are starting to see better learning conversations happening in a range of conversational contexts across the organisation and community. At Growth Coaching International, when we train educators in coaching, we talk about developing a ‘coaching way of being’ as individuals. Perhaps a coaching culture is about the emergence of a new organisational way of being. Chris Munro is a Senior Consultant at Growth Coaching International.